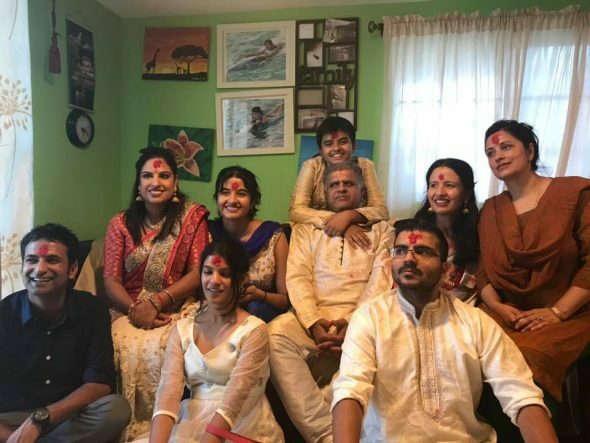 A new experience: I celebrated Dashain in Los Angeles and cherished the memories of home this year. For a while I have been homesick, however, this past week offered me a chance to connect with my family and my culture once again. Dashain is the biggest annual festival in the Nepali culture. I missed my home last week but visited my relatives in the US and had the opportunity to join in on the fanfare of celebration by the Nepali diaspora within the US. I visited my home in southern Nepal to meet my parents just weeks before arriving in Phoenix last August for my 10-month long Hubert H. Humphrey Fellowship at the Arizona State University. My family was happy for the opportunity, however, my mom was a bit disappointed. I would be away from home again, especially during the festive season. Last year, I missed the holidays because I was in New York covering global leaders at the UN General Assembly meeting. For the first time in my life I was not with my family during the Dashain festival. Worship: People visit temples and offer prayers throughout the Dashain festival. I played poker with my newly found friends in Jackson Heights, visited Nepali families within the community and attended a musical performance by a Nepali pop singer in New York. Before arriving in Phoenix, I had told my mother this year I would visit my relatives in Los Angeles and fully embrace the festival. As the festival approached, I was constantly reminded of the promise I had made to my mother. I had assignments and deadlines, a major travel scheduled for Washington DC, and a little bit of anxiety over being away from home so I booked a ticket to Los Angeles. 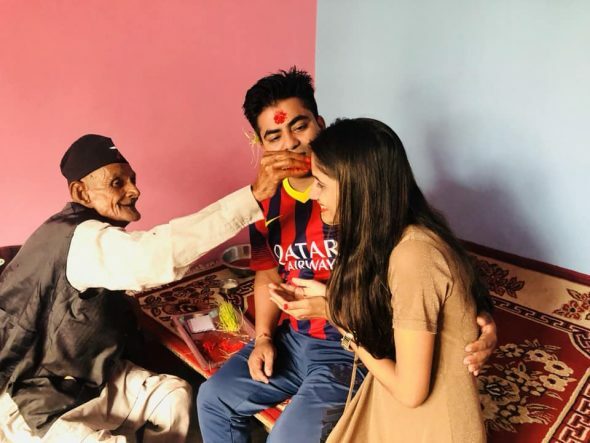 Tika: My sister receiving Tika from my 87 years-old grandfather during this year’s Dashain. Dashain which is also called Vijaya Dashami is most important festival celebrated by Nepalese throughout the world. It is also celebrated by Hindus in India and called Dussehra. Goddess Durga, the female deity of power is worshipped during the 15 day festival. The festival marks the victory of Durga over Mahishasura, a demon who was defeated in a fierce battle that lasted for 10 days. It also symbolizes the victory of mythological lord Ram over the notorious King of Lanka (modern day Sri Lanka) Ravana described in the Hindu epic Ramayana. 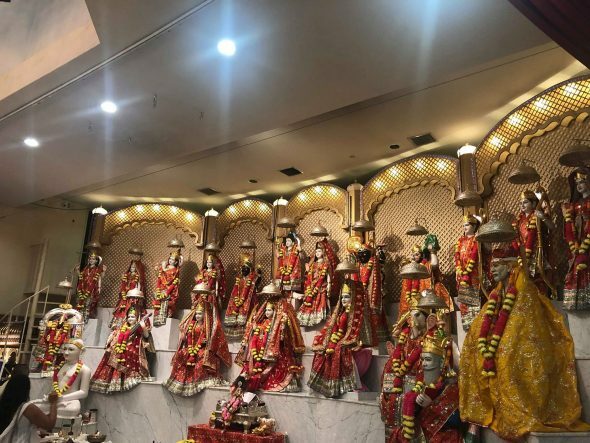 The 10th day is considered most auspicious, members of the family gather together and extend best wishes, it is a day that depicts family bonding. Elder members of the family offer “Tika”, “Jamara” and blessings to the younger family members. “Tika” a mixture of rice, vermilion and yogurt are placed on the forehead of people. “Jamara” a sacred plant that sprouts from seeds of grains are usually put in ears. During the festival relatives dawn new dresses, eat delicious food and swing. I remembered the celebration at home, missed the concert of my home town, could not play swings but essentially did everything in the US this year to feel the festival. I also watched the effigy of Ravana being burnt at the Hindu temple where my uncle is a priest. The visit particularly reminded me of when I would visit my maternal uncle’s home and he would give ‘lucky money’ and other blessings. I received gifts, travelled, made new friendship and overcame my anxiety during this year’s celebration. The holiday season can be a difficult time for anyone to be away from home. While there was celebration amongst Nepali communities worldwide during Dashain it was a business as usual for America and my cohort of Humphrey Fellows. However, I quietly sneaked into Los Angeles, shared happy moments with my relatives, enjoyed tasty “Dal-Bhat” (Rice and Lentils) and cherished the memories of home. Written by: Phanindra on October 23, 2018. First I would like to say that I am extremely happy you were able to spend the holidays with your family. I found your post to be not only incredibly well written but also extremely insightful. I learned a lot about your culture and what it means to celebrate the holiday of Dashain. Prior to your post I must admit I new nothing about Dashain, but in reading your experience and the history behind the celebration I feel more informed and that I better understand the culturally rich community from which you come.